I recently spent a week in southern Florida and the Keys looking for and photographing as many of the wonderful butterflies that were there. It was so much fun traveling around Florida and seeing these beautiful creatures. Hope you enjoy them as much as I do. Happy that i just decided to google what species of butterflies live here in South Florida; Pics are beautiful as you can appreciate the markings and colors. Thanks to the commenters as i learned a lot today; will have to look what the passiflora plant looks like. We have a lot of butterflies here, but wanted to know how many different there was! I photographed a butterfly on Key Largo (in the butterfly garden of the Crocodile NWR) that I cannot ID and that is not represented in your excellent gallery. Could I e-mail you a pic for your help? If so, to which address? Your photos are wonderful. You have helped me identify several butterflies. I have been enjoying my garden in Central Florida. This is great. Excellant work for identification ! @ Glenda-the milkweed bugs are aphids. Hose them down, squash or brush them away. Insecticidal soap will kill or discourage them from coming back. Alcohol also kills but will also kill monarch eggs so be carefull to apply directly to aphids and not the eggs. Last year (2015) I raised several Eastern Black Swallowtails May to July. They were all over my parsley. I planted more parsley this year (2016), but, haven't gotten any caterpillars even though I have seen at least on butterfly. We don't spray any insecticide on the parsley so I wonder why she didn't lay any eggs? Also, I planted some milkweed last year, but, the milkweed bugs decimated them before the monarchs had a chance to lay eggs on them. How does one keep milweed bugs away without harming the monarchs? We live in Homestead and have had a constant stream of Monarchs in our milkweed garden for at least 6 months or more. At one count we had a total of 45 caterpillars. The Monarchs are mating in the front yard now. Beautiful pictures. We live in Wellington, Florida and grow salvia, milk week, sour orange, coo tie and passiflora to grow butterflies. When we make one trip around our yard, we see soldier, queen, zebras,etc all the time. We love it. Used to get Monarchs but not anymore for maybe 2 years now. Any idea where they've gone? Outstanding collection. Looking forward to sharing the info. Thank you for the wonderful pictures. I can't seem to identify the butterful that I have seen flying around here in Dunedin FL. It is all yellow with (2) black stripes. It reminds me of a bumblebee. I can't find a picture so I have nicknamed it bumbles. Thank you and keep up the good work you do with the pictures. Thank you, Tom. This will help me in identifying the Butterflies I see on hikes or in my backyard. I plant a variety of butterfly plants so they will visit my garden. Wonderful photography. My husband and I were married at the Key West Butterfly & Nature Conservancy. Planning to go to Butterfly World this weekend for my birthday which is Friday. Thanks sir, your gallery helps me a lot. Thank you so much for keeping these wonderful pictures online for us to see! You have a lovely collection! to care for them when they're in trouble like the above situation? documents" file. Thank you in advance. P.S. I'm into cats and butterflies. Thank you Lord!!! Wow, all this in a week! Gorgeous pictures of these fantastic creatures. As I'll soon travel to Florida and the Caribbean, can you please tell me a few spots worth visiting if I wish to see Swallowtails, Fritillaries, and other large butterflies? Your pictures were very helpful in finding the butterfly I found in my yard, and the photos are just absolutely beautiful. Wonderful pictures. I am trying to plant a Florida friendly butterfly garden and hope you will one day identify the plants all these butterflies are on. 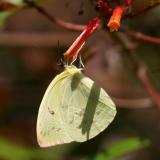 Wonderful photos, your site has been helpful in identifying the butterflies and skippers in my nursery. Outstanding pictures !!!! I am going to be in Miami/Everglades/Keys in Febuary 2013. I am looking for local butterfly contacts. Can you help me ? Henry Burton, hwb19191@gmail.com. Thank you for your time, may the butterflies be with you, Henry. Thank you so much for sharing these pictures as they are highly informative since planting different butterfly nectar plants in my backyard. Now I enjoy them while washing dishes. Thank you. Enjoyed your gallery very much. I've been planting a significant butterfly garden. I'm sure I'll be back here for identification. Guest Naples area - This a.m. I saw the giant swallowtail on an arbicola plant in the back yard. Seemed very happy just to sit there while I took my pictures. What I thought was a zebra Heliconian differs from your photo...it's yellow and white stripes. Beautiful gallery!! I saw a butterfly yesterday that was real pretty and with the help of your pics I was able to identify it as a Mangrove Buckeye. Thanks a lot for all the effort. Greatly appreciate your time/efforts to put this gallery together. Today(9/9/2011 was able to identify thru your photo the White Peacock Anartia jatrophae. Could not confirm via my books, your photo was excellent. Also saw the white lined sphinx moth. This is great work Tom, thank you! I found the butterfly I was looking to identify and now I know what I shot a photo of. I am sure I will be back to identify more as I photograph them. Wow Tom, this is an incredible album. Thank you SO VERY MUCH for the identifications. I live in Arizona. We have the Desert Botanical Garden here and they bring in Florida bflies for a special pavilion they built. You walk in and they are flying all around you and land on you. Very special. Have some great pics but can't find my "guide" from DBG to ID them! Tom..I'm in the midst of reading Mariposa Road by Michael Robert Pyle. I just finished the chapter where he scouts for Leps on Sanibel Island and the Everglades. Now your wonderful photos allow me to put images with Pyle's narrative. There are thousands of white or cream colored butterflies all over the ligustrum tree in my back yard. would like to know about them. I have been enjoying them. Excellent photography. You should publish a guide book. Down here in Citrus County Fl there are so many butterflies lasrge swallowtails, zebras, tiny blue ones. dark orange ones yet when I was out in California three weeks ago I saw none not one. Is global warming wiping out the west coast species. They are hard to photograph but glorious here. Thanks for these great shots I will use them for i.d purposes. I found a rusty/red/brown/orangeish bitterfly with large white patches in florida. Any ideas on who this little guy may be? I have added this site as a favorite so I can easily go back and view as I see each new butterfly. They seem to like my cosmos flowers. I haved seen about six different butterflies on them on a different day. John, It sounds like you have a picture of a Luna Moth in the late stage of it's life cycle. I live just outside of St. Augustine Florida. I noticed this particular fascinating butter fly stuck to the wall out side. It's been there for almost 2 days now and is alive. It has large gray-brownish wings with some brown mixed in them as a light strip and an eye like figure in the center of each wing as well as a speck of black on each tip. It also has a huge thick body and its antennae are like big fans with many minute comb-like structures attached to them. I've taken several pictures but cannot find any on the web that match mine. Does anyone know who I can send my pictures to to see if they can find out what type it is or is it a moth perhaps? Looking for help in sunny Florida. Thanks for the wonderful site--and the help in IDing a Gulf Fritillary today at St. Augustine Beach. Thanks for helping me ID the butterfly I saw this weekend - the Mangrove buckeye on Mound Key, Lee county FL. There were dozens of zebras too - more than I've ever seen in one place! Your site is nicely done, and your work is wonderful. As a new resident of South Florida, I have used your site regularly to help me ident these gorgeous flights of fancy. Thanks! My husband and I were out land surveying in the woods in Central FL. I noticed this beautiful black, quite large wingspan, with these goreous bright blue dots on the bottom of their wings. Look up Eastern Tiger Swallowtail and see if that is your butterfly. trying to identify a butterfly my son and I see all the time in our backyard. It has a very large wingspan, at least 6 ", is a vibrant yellow outlined in black with the black coming down almost into vertical stripes. The ends of the wings have what is similar to a reversed scalloped effect. Any ideas? Thanks. Your pictures are helpful & beautiful. I am trying to identify a butterfly I saw in my Orlando yard this week. It was flying pretty close to the ground & was perching on grass. Maybe a hairstreak? It was small and grey-ish brown with a small red dot on the lower hind wing. When it opened its wings, the upper side was a beautiful dark blue. Any idea what it is? This past weekend I capture a picture of a White Peacock. Yes Monarchs migrate south from all over the U.S. and most of them overwinter in Mexico. Do monarch butterflys migrate? And beautiful pictures,do you do photography? thanks i needed to look up butter flys for my project i have to pin 20 insects on a board! Great photographs. Your site helped a back yard rookie like me and made it more enjoyable once I knew what I was looking at and what to look for. Keep it up. the pictures were so beautiful and so very well organizied not like other sites that you see on the web. Great pics! Just back from Keys this weekend where I saw litterally hundreds of butterflies this time of year mostly Zebra's, in yard covered with male flowering papaya trees, besides other flowers this is one overlooked plant that is easy and cheap way to attract some locals butterflies. Thanks! Beautiful pictures. Love the web site. I was trying to identify a picture I took of a butterfly that may be an American Painted Lady butterfly. I did not see one on your site though. Amazing gallery! Thanks for sharing. Tom, I agree with everyone. Your photos (all of them) are wonderful. I am sitting here with my son who is deaf and thoroughly enjoying these photos together in preparation for our trip to Florida. It really makes one feel so humble when the beauty of nature is captured so poetically.Thank You!! What incredibly beautiful photos. Thanks so much for sharing them. They are the nicest I've seen on the web. Delightful photos! We currently have a number of pupae attached to funny places..nozzle of empty spray bottle and the corner of an eave. Since the caterpillars were so numerous, they finished all our parsley and dill. Today we saw the palamedes swallowtails flit in to lay more eggs. 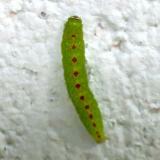 The caterpillar has numerous rows of 3 yellow dots. You have verified the species for us. Thank you! Thanks for the compliment, and I'm glad my gallery was of help to you. Butterflies are such a diverse and colorfull group of creatures, that it's hard not to like them. These are the best pictures of butterflies I've ever seen, especially all in one place. I spotted a new butterfly in the garden this morning and wondered what kind it was. Through this site, I have immediately identified it as a Soldier. Thanks! Love the colors! Beautiful photos. What a beautiful array of butterflys. Very well presented.